Who says Inside Croydon doesn’t promote local Tory events? Rhetorical question, to which the answer is the self-serving MP for Croydon Central, Gary Barlow. Look what the Croydon Conservatives sent out to anyone on their email circulation list yesterday, including many who have repeatedly asked to be removed from the questionably run database. 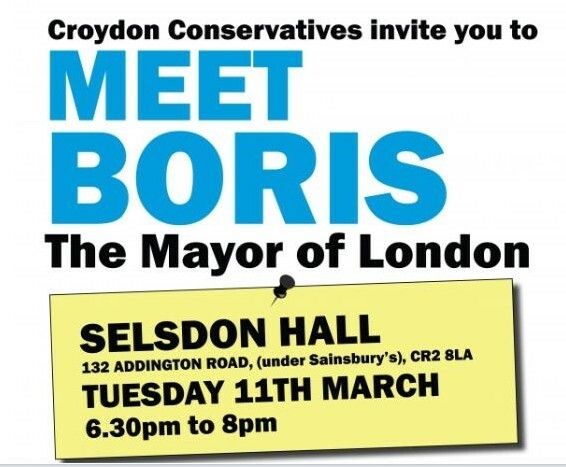 Boris Johnson, the Mayor of London, is giving a little talk deep in the south of the borough next week (odd how he’s not visiting the riot-scarred and fly-tipped northern bits of Croydon, isn’t it?). The email says Boris will “be taking questions”. It’s unlikely he’ll offer any answers, though. But our London Mayor Boris doesn’t do answers. Since he was elected Mayor in 2008, he has not done a single regular press briefing at City Hall (Ken Livingstone used to do them weekly). So any attendees next week probably won’t be allowed to get past “How do you do?” to the adulterous Old Etonian, Bullingdon Club bluffer. But what’s this, you say, there’s more? Yes, yet another leaflet distributed by the Arfur Daleys running Croydon Conservatives which fails to state its true intentions. So Croydon Conservatives are now charging people to get a chance to speak to their elected representatives? Really? A tad infra dig, as Latin-spouting BoJo might say, don’t you think? What it doesn’t state is for what purpose the 10 quid is being collected. Is it for the 2014 local election campaign fund? Is it to get Gary Barwell re-elected in Croydon Central in 2015? Or is it for Boris’s own campaign to get elected as leader of the Conservative Party? The local Tories really should learn to be a little more frank and honest with their publicity. 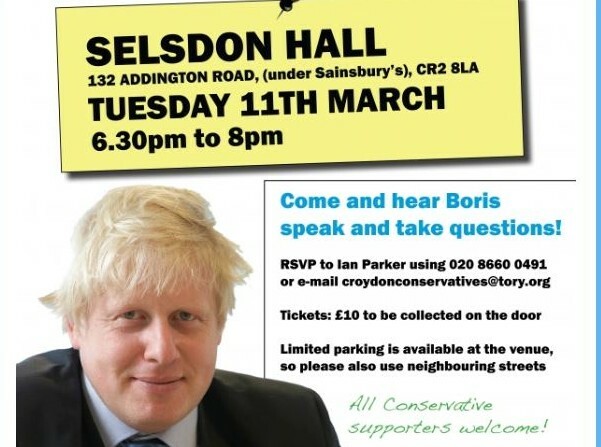 But then co-ordinating this latest Boris stunt is Ian Parker, the soon-to-be-ex-councillor for Coulsdon West who in 2010 was given a judge’s warning for not declaring proper election expenses for the Croydon Central and Croydon South MPs’ campaigns. “All Conservative supporters welcome”, the email says. Though since Parker and Co sent it to many non-supporters as well, presumably we can all pile up on the day to hear the London Mayor “take questions”. “Sir” Tricky Dicky Ottaway might end up calling out the police again if any octogenerian pensioners turn up that he doesn’t recognise. This entry was posted in 2014 council elections, 2015 General Election, Boris Johnson, Chris Philp MP, Croydon Central, Croydon South, Gavin Barwell, Ian Parker, Mayor of London and tagged Barwell, Boris Johnson, Conservative, Croydon, Croydon Central, Croydon South, Gavin Barwell, Ken Livingstone, London Assembly, Tory. Bookmark the permalink. Are they going to give Nectar points? But you fail to draw attention to the comment about parking facilities. Quote “limited parking so please use neighbouring streets”. That, of course, is if you don’t have to pay for it after 6.30pm like you have to in Central Croydon. What incentive do Croydon’s residents have to frequent restaurants in the town centre when an obligatory “surcharge” on your evening, courtesy of the Croydon Council, is imposed to park your car? All pay and display charges should be abolished after such a time. However, I’m sure the residents of the Addington Road area are delighted with such a recommendation! jcb76s post refers. Ooh can I join you?